Navajo-Churro sheep and Angora goats for sale. Dancer and black and white kid. Mr. Wilson and the Kid share breakfast. Ram lambs and Angora goat bucklings. 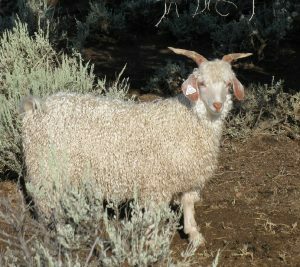 The Ovie Ranch specializes in raising Navajo Angora Goats. Our Angora goats are primarily raised for fiber (mohair). We don’t use herbicides on our pasture. The goats help in pasture management, they love to eat a little bit of everything including juniper trees and sagebrush. 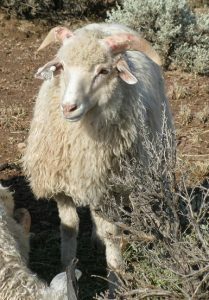 We have wool (a few Navajo-Churro fleeces) and mohair fiber available for sale (see link below). We currently have two white Navajo-Churro rams for sale. We do supplement with grass/alfalfa during the pasture non-growing season. We do vaccinate our flock as needed, and treat for parasites (internal and external) as necessary. 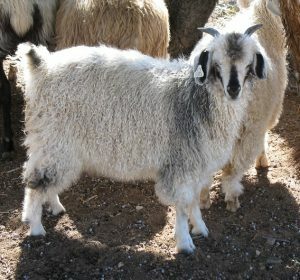 White and naturally colored adult, young, and kid Mohair available for sale. Members of the Navajo-Churro Sheep Association. Members of the The Livestock Conservancy.